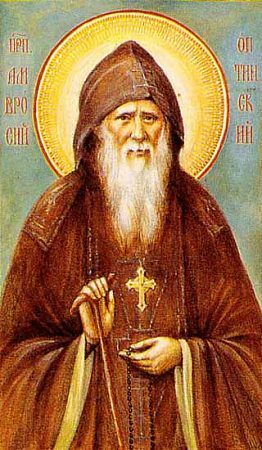 Once two sisters came from St. Petersburg to Elder Ambrose [of Optina]. The younger one was a prospective bride in a joyful mood; the older one was quiet, thoughtful and reverent. The first asked a blessing to be married, the other to go to a monastery. The Elder gave a prayer rope to the fiancée and said to the elder sister: “What kind of monastery? You’ll get married — but not at home that’s what you’ll get!” And he named a province, to which she had never traveled. They both returned to the capital. The bride learned that her bridegroom had betrayed her. This brought about a terrible change, for her emotional attachment was deep. She comprehended the vanity of all that had occupied her before; her thoughts turned to God, and she soon entered a monastery. Meanwhile, the elder sister received a letter from that distant province from an aunt she had forgotten about, a devout woman who lived close to a women’s monastery. She was summoning her to have a look at the life of the nuns there. But it turned out otherwise: while living with her aunt, the niece became acquainted with a man no longer young but quite suited to her by his character, and she married him.